IECC beat Wyverns by a margin of 129 runs in its first KCL match of this season. The game was played at the picturesque Shizuoka cricket ground on Saturday, May 26, 2001. 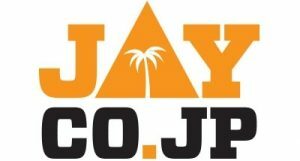 As both the teams were late in arriving at Shizuoka, the match started at around 2 PM. The captains agreed for a 30 Over duel in stead of the usual 40. Biju Paul, captain for IECC, magnanimously refused to accept the offer of Wyverns’s captain to hand-over the toss in favour of IECC, for having arrived a few minutes late. Biju subsequently won the toss and elected to bat first. Thanks to Robert, the godfather of cricket in Shizuoka who was also the umpire for the match, the wicket was readied immediately after we arrived there. With reports from previous teams about the uneven bounce of the pitch (Silvy- was it, having to dig the ball from the ground or play it over the head), and also to cover the softness due to rain, a mat was laid on the pitch. In spite of this, wicket was slow and some balls kept very low indeed. Sanjeeb Sahoo and Bhibas Roy opened the innings for IECC. The bowling and the pitch was so slow that the batsman had to wait patiently for the ball. 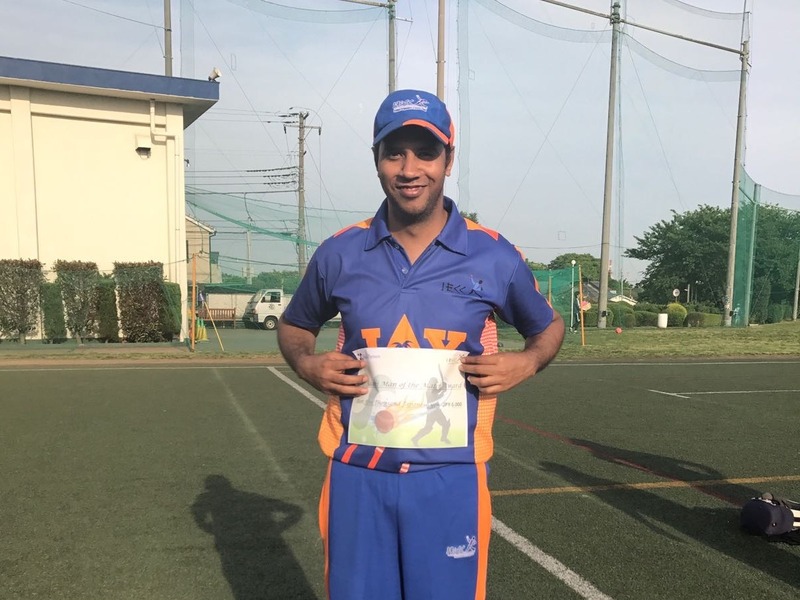 However, Sanjeev (who had earlier lost all of his patience while travelling to Shizuoka, thanks to the traffic jam) was bowled while trying for a big hit and missing the line completely in the 4th over while the score was at 11. One down Viswa Ghosh, who was making his debut for the team, joined Bhibas and the pair put on 60 runs for the 2nd wicket. 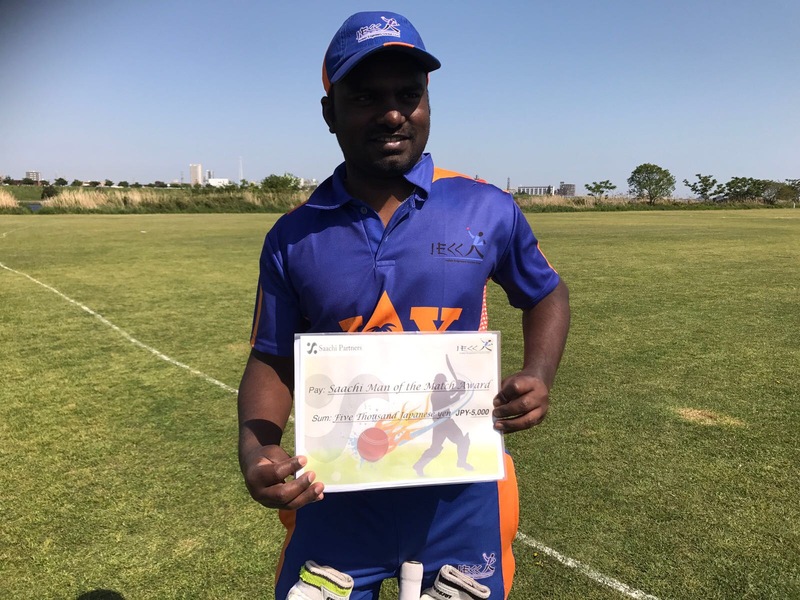 Sriram, who had a half century already under his belt this season, joined Viswa at the fall of Bhibas’ wicket – caught in the deep with a personal score of 18 – in the 13th over with the team score of 70. And what an onslaught it was! He hit the bowlers all over the place. Both these batsmen sent the ball to the fence/banks of Abekawa regularly and the scores moved rapidly. Sriram capitalised on an early let-off on a miss-hit, never looked back. Vishwa was gaining in strength with his immaculate timing and power. Such was their onslaught that extra fielders(from the batting side!) had to be placed outside the boundary to fetch the ball. The Wyverns fielding was not at its best. There were few islands of excellence, but they missed couple of chances in the air as well as on the ground, in fact, on one occasion both Sriram and Vishwa were on the same side. This let off, however, did not cost them further as Vishwa got out soon after, to a tired looking shot in the 21st over with the team score at 126. He scored 57 in his first appearance in a league match and the team looks forward to more such innings from him this season. The third wicket partnership also added more than 50 runs. Silvester joined him and continued at his usual pace taking ones and twos. With overs going by, Sriram moved into next gear with more fearsome shots on the on-side. He finally got out at his individual score of 71 but ensuring the team had a fighting total. The forth wicket partnership also lasted for more than 50 runs. These long partnerships were a feature of the IECC innings. The Wyverns must have learnt at least one thing from the match – If you give Sriram a chance then you have no chance. By the time Sriram got out we were in the slog overs, and everybody who went in tried to make runs as quickly as possible. Every one contributed at the end although none of them had long innings. Santosh did not last long and so did Jagan and Prasad. Silvy continued at the other end showing persistence and occasional flare, and Biju joined him and the pair remained not out with 18 and 4 respectively. The final total was 203/7, with Ashok Sharma and Shafeeq Virani remaining to bat. The fact that 200 plus score was obtained in 30 overs is worth mentioning. A score of 200 plus, in 30 overs, will put even the mightiest of teams to ponder. Wyverns fended the first over from Biju cautiously with a couple of deliveries that beat the bat. Jagan at the other end was in full fire and got the wicket of the opener by displacing the middle stump. In his next over he had another wicket, Caught and bowled, and what a catch it was – catch of the match! Jagan on his follow through dived forward full stretched and picked the ball inches from the ground close to the short mid-off area.- Superlative performance. Apart from Biju driving into the concrete bench at the ground and breaking it – may be to put the newly acquired scorers’ box in full use – there was an event in the early overs worth mentioning. A good ball, batsman edged, Sriram, keeping wickets took it on the first bounce and the close-in fielders appealed intuitively and the batsman walked, the umpire also gave him out but, Sriram and some of the players realised that it was taken first bounce and recalled the batsman. Win or lose, it is small events like this that keeps the spirit of the sport flying high. Yet another event was when the fielders felt sorry for a batsman and was consoling him while he was out due to sheer bad luck. The ball pitched on the good length spot, kept low and hit the batsman on his shin or shoes, bang in front of the wicket. Vishwa again performed well with his bowling skills although he did not get any wickets. The Wyverns never looked like making it anywhere near the IECC total. They were overwhelmed by tight bowling and were just trying to block the balls and delay the eventuality. Shafeeq bowled his left arm off-spinners for which the batsmen had no clue whatsoever. He even picked up two wickets of successive deliveries. Bhibas also bowled a few overs and picked up one wicket. Ashok came into bowl his leg spinners from the other end and he bowled a beauty of a delivery. The batsman was beaten by the spinning delivery and was bowled comprehensively. Santosh and others were trying to name that particular beauty and I am not sure if they finally settled on “Sonali”. 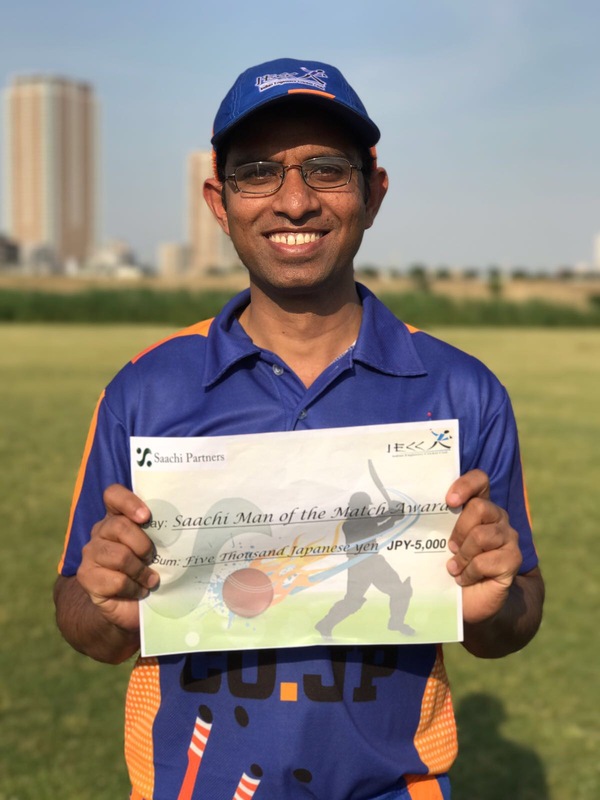 Santosh, our Zahir Khan, bowled a few deliveries that beat the bat and kept Sriram busy and one of them had a tip of the bat on its way to Sriram. Sriram’s performance behind the stumps was as good as his performance in front of it while batting. In all, 8 bowlers had the opportunity to bowl and it seems like I forgot to mention about Silvy. He was so upset with the occasional uneven bounce of the pitch that he chose to bowl full tosses instead. Finally, Jagan came for his second spell and wrapped up the innings for 74 runs. He picked up 3 wickets giving away just 7 runs. A winning margin of 129 runs for a 30 over game! An impressive victory even discounting the fact that the opponents were weak. With Silvi offering to celebrate the winning performance with beers and snacks, and the lovely coconut ladoos from Vishwa’s home (special thanks to his wife- hope such gestures will encourage others too), the trip back to Tokyo was very entertaining. The music was switched off and there was a treat of Anthakshari. The back seaters were doing well and the others were giving a good fight with occasional new lyrics from Ashok. Silvester inspired by the presence of his girlfriend, always pitched in with some romantic numbers. While all this was happening behind, our captain was literally driving us safely leaving behind his mark on the broken bench at Shizuoka- thank you Biju! THREE CHEERS TO IECC. HIP HIP….H..U..R..R..R..A..Y..